WICKED! (wicked) WICKED! (wicked) WIIIICKEEEEED!!! Saw Wicked last night, thanks to Steve on Broadway. Unfortunately, his flight to Chicago was cancelled at last minute due to some snow, so, like the generous gentleman he is, he offered his two 2nd row center tickets to me. Thank you, SOB! This is my third time seeing this megamusical, and my second time seeing it from the second row. This show is undoubtedly a marvel, and my relationship with the show has evolved greatly. Four years ago, I was very anti-Wicked. And now, with three viewings under my belt, it’s grown on me very much — to the point of liking it. A lot. While the physical production takes your breath away, the play’s the thing, and when you strip away all the Eugene Lee scenery and Susan Hilferty costumes, it’s really a simple story about the the relationship between two women: Glinda, the “good witch,” and, Elphaba, the “wicked witch.” And two strong singing actresses must be capable of carrying this ginormous show. For Glinda, we had an understudy: Marissa Lupp, fresh from NYU. She offered a very underplayed Glinda, which would be fine it wasn’t so out-of-synch with the loopiness that’s directed of her in her showcase number, “Popular.” I won’t say much more about Ms. Lupp’s performance, since being an u/s is hard work, but I will say her teary curtain call was the most emotion I saw from her the entire night. Respected Chicago actress Barbara Robertson has stepped into the Chicago run of this tour to grace us with her unmatched Madame Morrible. She’s joined by another local favorite, Gene Weygandt, who is a wonderfully warm and befuddled Wizard. If you like Wicked, you’ll like this production. 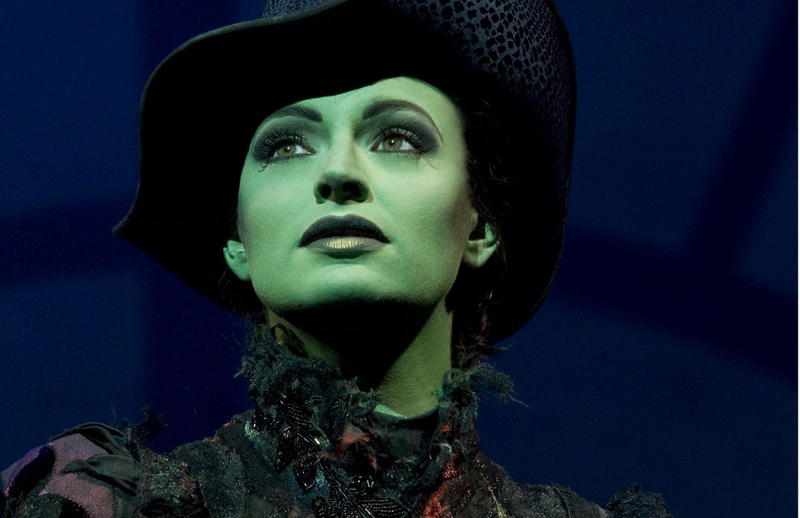 If you don’t like Wicked, take someone who does, and you just might find yourself cast by its spell, like I’ve been. It’s not brilliant theatre, but it certainly entertains and keeps you fully engaged, which is helped greatly by a spectacular physical production. Why are they calling it the “first national tour” when there have been other touring companies before? Tres stranges..I’ve seen Wicked 2x in Chicago and my last viewing was in London, where I left at intermission. Never left a show during intermission in my life before, but this show works well in America and in an American accent. I could not sit through a stiff upper lip imitation of the original. Did the teenagers go insane when she started flying? The first time I saw Wicked it was on tour in Providence in 2007. I wasn’t yet a regular theatergoer but I went at the encouragement of Steve on Broadway, whose blog I’d recently found and who had become an e-mail friend. And I’m so glad I did. It was so vivid and I loved all the witty references to the Wizard of Oz. I was in tears at “For Good.” And how great is it that the most moving song in the musical is about the enduring power of friendship. Wicked certainly is a great “gateway” theatre piece. And look! It’s made you the theatre-queen you are today. My “Wickeds” were Cats and Phantom. I’m a hard-core Phantom of the Opera fan and was quite delighted when I got to see Wicked while on tour several years ago. I’m happy to be going to see it again March 4th. I would have preferred to see it earlier but the pre-sale began before I was able to buy tickets and all the best seats were gone LONG before I could take part in it. The seats I have for the 4th aren’t bad but with it being such a great show no location really is. Previous Post Crafting with friends!